This post is by Ryan Van Etten (@ryanve), Editor/Producer of VirtualMusic.tv; he was our featured corespondent at New Music Seminar in New York. 10 seconds to engage someone—to impress them. In his research for Futurehit.DNA, Jay Frank discovered an impressive trend: Shorter song intros lead to better sales. "2/3 of bestselling songs have an intro that's less than 7 seconds." The average intro length for Top 25 songs is 6.6 seconds. "You really have 10 seconds to engage people." Get to the hook. "Make it impactable." Frank stated that "people are going to come to you first through song." Through Google. Essentially, bands can expect fans to find them through song names and lyric clips because that's how fans search and discover. "Make sure you search your own song." That is, search the title before you release it suggested both Jay Frank and Ariel Hyatt. Based on the initial search results an artist can tweak their titles for SEO. LTR: Ariel Hyatt (moderator/Ariel Publicity), Jay Frank (Futurehit.DNA), Gwen Lipsky (SoundThinkingNY), Eric Garland (BigChampange), and Mike Doernberg (ReverbNation). On this slide they brought up the issue that a lot of artists are trying to monetize too early. Create, grow, and then sell. "Don't try to sell something if you're trying to get fans because that's an obstacle when what you want is their attention." 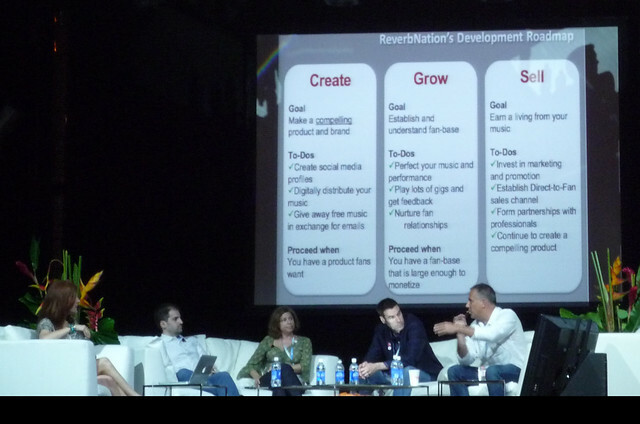 – Mike Doernberg, CEO, ReverbNation. 10 seconds. You already lost me. 28 hours later a different panel, The Creative Conundrum, critiqued the three artists who made it to the Artist On The Verge finals. Only half the panel had seen the show the night before and the rest were judging based on a 10-second video clip. Were they insensitive? Yes. They were ruthless. But were they true to life? You tell me.